Do you have sudden hip, shin, toe, or foot pain every time you exercise? If it’s a deep soreness that you first noticed after a sudden increase in your activity level or a recent change in activities, you could have a stress fracture: a hairline crack in the bone. Stress fractures are overuse injuries that tend to occur in the weight-bearing bones of the lower body. They may develop when you subject your bones to repeated stress and force—for example, when running, walking, or jumping and landing. Over the course of a long workout or a series of workouts, your muscles can become fatigued. If you continue to push hard when your body is tired or overworked, the impact forces get transferred from muscle to bone. Also, the cumulative effect of frequent, hard exercise can weaken bone. If you are training regularly but don’t allow enough time to rest within or between high-intensity workouts, your body may not be able to remodel stressed bone before you stress it again in your next session. The effect is a breaking down of bone faster than it can rebuild itself. (Similar to what happens to muscle if you don’t allow recovery time.) This constant stress makes the bone weaker and more likely to crack when subjected to impact forces. The result: small, crack-like fractures in the bone result. Stress fractures don’t break the bone all the way through like the full, acute fractures associated with a fall or accidental blow. Rather, they are more like splinters in wood. Long-distance runners—especially runners of road races like 10Ks and marathons—frequently develop stress fractures because they’re subjecting their muscle and bone to substantial force over time, often without sufficient rest and recovery. (And sometimes without replacing their running shoes often enough to keep up with their mileage.) The same is true for soldiers, who train to walk and run long distances in combat boots. 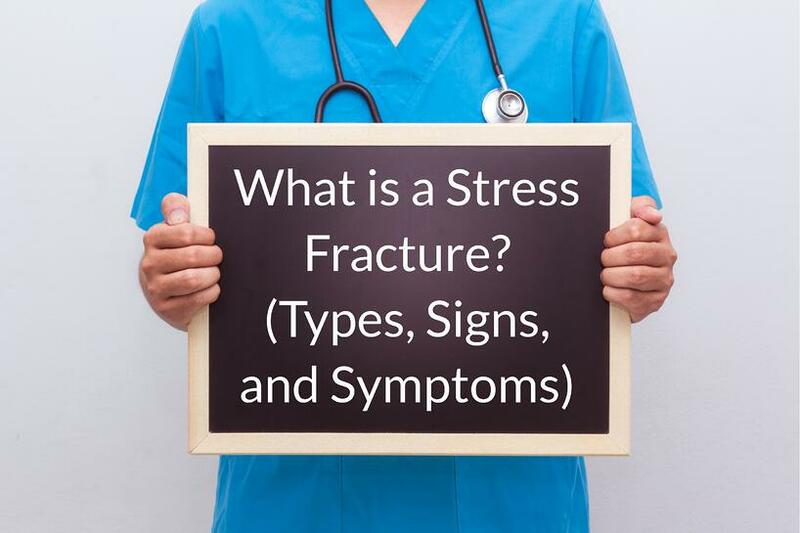 Though not as common, stress fractures can occur in the upper body (for example, in the ribs, wrists, or arm bones). If you are an athlete who uses your arms, shoulders, or trunk forcefully, or if you have a loss of bone density from age or osteoporosis, it is possible to experience a stress fracture above the waist. For example, it’s quite common for elderly people to develop stress fractures in their wrists. However, stress fractures more commonly affect load-bearing bones of the lower body. In most active people, the legs and feet bear the brunt of the forces involved in playing sports, running, and other physical activities. 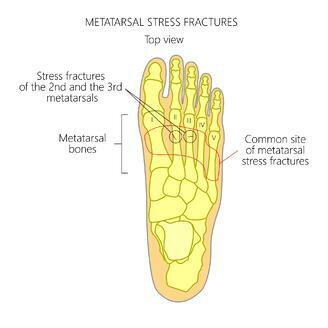 Those three areas are the most likely to be experience stress fractures. How do you know if you have a stress factor? It’s not possible for you to know for certain without visiting a doctor for imaging (e.g., X-ray, MRI, or bone scan). Stress fractures are often “invisible” injuries and don’t always show outward signs like swelling or bruising. Also, the symptoms can easily be confused with pain from other injuries such as a tendon tear, ligament sprain, or muscle strain. Some people describe the pain of a stress fracture as a deep soreness that gradually becomes debilitating or excruciating as you continue to move. The pain builds over time, eventually making the activity difficult if not impossible. When you rest, the pain subsides, but it will likely return when you resume activity. The only real way to confirm a stress fracture is to see a doctor for imaging. Even then, diagnosis can be tricky because stress fractures are so thin they are not easy to see on X-rays until they’ve started healing. You may need to have additional imaging to confirm the injury. What are the risk factors for developing stress fractures—and what are some of the causes? Being female. Girls and women are more prone to stress fractures due to a combination of lower bone density, hormonal changes related to menstruation, and nutritional deficiencies caused by excessive dieting or eating disorders. In girls and women who are still menstruating (but experiencing irregular periods), this is referred to as the Female Athlete Triad. Past and current bone health. A history of stress fractures in the same location can make you more likely to re-fracture. Osteoporosis/low bone density makes you more susceptible to fractures as well. Diet and nutrition. You’re more prone if you take in insufficient calcium and vitamin D, both of which are necessary to support bone growth and remodeling. Biomechanical issues. Poor posture or structural irregularities in the legs and feet (including bunions, bone spurs, and fallen arches) can affect how forces are distributed throughout the body. Anything that changes your gait can do the same—for example, if you shift your weight while favoring an injured foot or leg. Insufficient conditioning/weakness. Weak or tight (under-stretched) thigh, calf, buttocks, and foot muscles are a major contributor. Pushing yourself hard when you’re not in shape (like weekend warriors tend to do) almost guarantees an injury to either bone or soft tissue. Environment/gear issues. Running on a hard surface like asphalt, granite, or concrete, or exercising in thin-soled, unsupportive shoes, can each be punishing to the legs and feet. When you combine both, you’re exponentially increasing your risk of getting hurt. Pushing yourself faster and harder than your fitness level allows is a recipe for injury. Obesity. Carrying extra weight puts more stress on joints and bone. It subjects the body to greater force when running and walking. Some studies indicate that obesity and being overweight also contribute to loss of bone density. High-impact sports and athletic activities are more likely to lead to stress fractures. Any physical activity that involves brisk walking, running, or jumping repeatedly on a hard surface can make you more prone to injury. High impact aerobic workouts like Crossfit, P90X, kickboxing, etc.